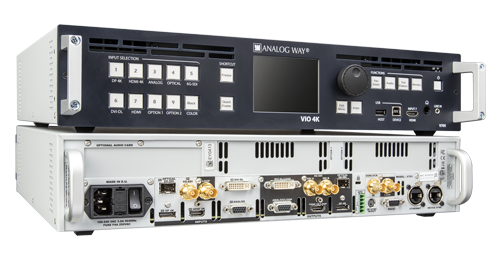 Analog Way Booth C1662 highlights will include several models from the Picturall™, LiveCore™ and Midra™ series as well as Analog Way’s premium multi-format converter (VIO 4K) and event controller (Vertige). Analog Way products can also be seen in other manufacturers' booths, including Digital Projection to showcase their new INSIGHT Laser 8K projector and Silicon Core to drive their 4K HDR displays. Versatile, reliable and ruggedized, the new Analog Way mission critical media servers are engineered for the support of massive events and installations from one single server unit. They are based on the field proven Picturall Linux software engine, renowned for its extreme reliability, easy setup and flexible control solutions. Featuring resolutions up to 8K, uncompromised playback performances and up to sixteen 4K@60 10-bit pixel accurate outputs per unit, the Analog Way media servers are the natural choice to drive corporate events, live shows, high-end theatre productions or large-scale digital signage projects around the world. The Ascender 48 - 4K - PL is a cutting edge, solid state, multi-output 4K seamless switcher and video wall processor. Like all the products of the LiveCore™ series, it is built for dependability and engineered to survive tough live event environments and long-haul fixed installations. Flexible and powerful, it features state-of-the-art 4K live processing capabilities, true seamless switching on all layers as well as an intuitive web-based user interface, which helps the operator unleash their creative potential. Ascender 48 - 4K - PL offers 12 inputs, 4 outputs + 1 multiviewer, 48 scalers and 6 true-seamless scaled layers plus a native background layer per output. For large-scale shows, several chassis can be synchronized together to create huge video canvases with up to 96 outputs and 192 megapixels. 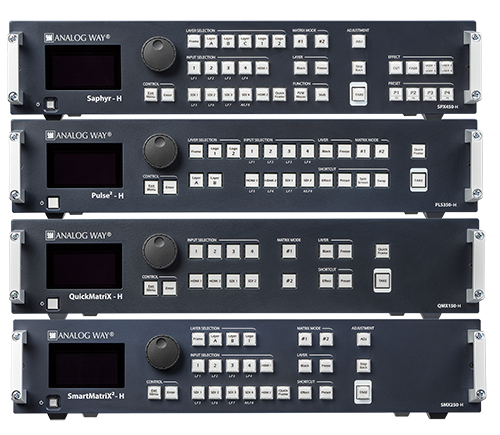 The Midra™ series of seamless switchers delivers Analog Way’s uncompromising processing and high-quality manufacturing in a cost-effective, easy to use range of products with outstanding value-for-price. Introducing HDBaseT™ support on QuickMatriX - H, Pulse2 - H, SmartMatriX2 - H and Saphyr - H models further boosts the units’ versatility and offers more flexibility for fixed installations. These four models feature up to ten seamless inputs, including two or four HDBaseT™ inputs supporting video, embedded audio and Ethernet pass through. The first two HDBaseT™ inputs also support PoE+. Each new model also features two outputs with mirrored HDMI and HDBaseT™ connectors. In addition to HDBaseT™ support, these four new models continue to offer advanced video effects for elegant AV presentations; real-time, ultra-low latency image processing; true seamless switching; advanced audio management and a user-friendly drag-and-drop GUI. The Midra™ series is controllable via standard automation drivers and advanced IT protocols. The VIO 4K is the all-in-one multi input/output solution for any advanced conversion application. 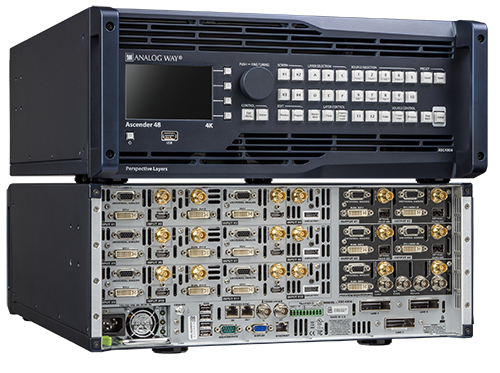 Analog Way's premium all-in-one video scaler, scan converter, switcher, coder and transcoder can convert any input signal format to any output format up to 4K60Hz 4:4:4. It features the latest generation of connectivity and can also process embedded or de-embedded external analog/digital audio signals. Engineered to be road-hardened to survive demanding live event environments, it provides worry-free operation with maximum uptime and low maintenance. With three slots for optional I/O interfaces and an extensive set of expansion modules, the VIO 4K is expandable and future proof. The VIO 4K real-time 10-bit processing engine ensures crisp and natural images whatever the source and scaling level are, while maintaining ultra-low, 1 frame latency. With the intuitive user interface, operators can fully adjust their displays and control them during live events.